202 North Davis Street, Sulphur Springs, Hopkins Co.
An excellent example of neoclassical architecture designed by James Knox Taylor, one of the most prolific supervising architects in U.S. history, the Sulphur Springs Post Office has always been a source of pride for the community. The building sat vacant for years and was in danger of demolition but town leaders and residents united to save it and give it new life as the home of Sulphur Springs City Hall. Exterior work focused on cleaning, repair and restoration of historic features, including the southeast entrance door. The building had already been significantly altered over the years, so the rehabilitation was able to bring back original features while still improving accessibility. Interior work involved the restoration and recreation of historic elements including the opening of previously infilled windows. Years of neglect and casual alterations had undermined the full potential of the building, but this careful restoration took great pains to preserve the elements that characterize the historic structure. 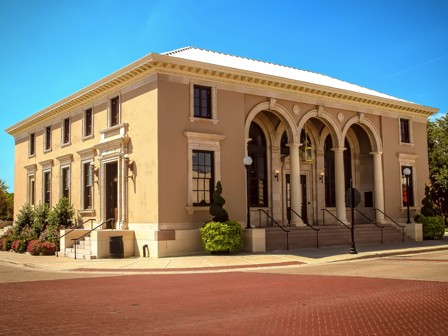 The citizens of Sulphur Springs are proud to see the old Post Office reborn as City Hall and returned to the appearance they remember and love. The town has found a solution to a need that respects the past and makes good sense.